Book 2020 river cruises at lower 2019 prices, plus fly for free in economy from select gateways or save $3,000 on this departure. Click here for eligible departures. Freechoice: Discover Banteay Srei and visit the Landmine Museum or admire the skills on display at Artisans D’Angkor. Alternatively, cruise on Tonle Sap (seasonal), take a tuk tuk to the markets, or a tethered balloon ride (weather dependent) above Angkor Wat before visiting a Pouk Silk Farm and Preah Khan Temple. Freechoice: Journey to the Killing Fields and tour Tuol Sleng, or join a hands-on Khmer cooking demonstration. Alternatively, explore by Tuk Tuk Phnom Penh’s colonial buildings and Central Market. Freechoice: Visit the farmers on Evergreen Island and enjoy a ride in a Xe Loi or cruise by speedboat to Chau Doc and walk through the market, visit a family-operated fish farm and cruise around Chau Doc waterfront. Alternatively visit Tra Su Bird Sanctuary. Drive to Ho Chi Minh City and enjoy an orientation tour around your hotel for the next two nights, the elegant Intercontinental Saigon. Spend the remainder of the afternoon at leisure. 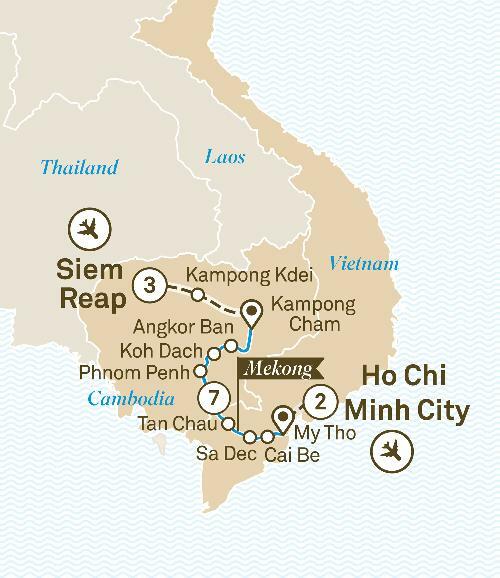 Travel from Cambodia's Siem Reap to Vietnam's Ho Chi Minh City and discover the way of life on this extraordinarily diverse waterway; the marvellous Mekong. The essential dynamism of South East Asia is unveiled as you travel from Siem Reap in Cambodia to Vietnam’s Ho Chi Minh City. The way of life on this extraordinarily diverse waterway will wrap itself around your heart, leaving you with a greater understanding of the marvellous Mekong.